Former Capetonian Stelio Savante is making history in a lead role filmed in Equatorial Guinea. This is the first feature film to ever be shot in the small African country that’s usually more famous for its despotic regime than its movie-making industry. Savante, one of South Africa’s top acting exports, stars in “Where the Road Runs Out”, a powerful human rights drama that proudly boasts to be the first from Equitorial Guinea and that promises to take its viewers on a journey “as unforgettable as its people”. Directed by South African Rudolf Buitendach, and featuring magnificent cinematagrophy and finely selected music, “Where The Road Runs Out” has all the makings of a Hollywood movie, but with African soul. Savante stars opposite the fantastic French C’sar-award winner, Isaach De Bankole (“Coffee and Cigarettes”), Juliet Landau (daughter of Martin), and the irresistable South African child actor Sizo Motsoko (best known for his role as Luyanda Nkosi in ‘My Perfect Family’). 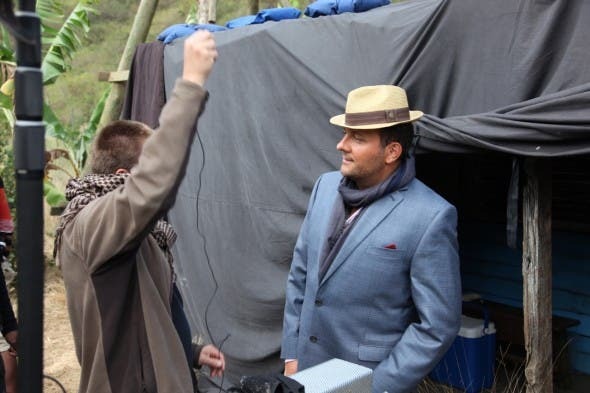 The movie, which was also shot at locations in Durban and Holland, partnered with special social partner SOS Children’s Villages Weltweit, the world’s largest charity dedicated to orphaned and abandoned children. Where The Road Runs Out Official Trailer from Firenze Film on Vimeo. Savante became South Africa’s first male SAG nominee (along with the rest of Ugly Betty’s lead ensemble cast) for his role as Steve in the hit television show. Although he was diagnosed with Celiac’s Disease in 2011, it has not stopped the Hollywood-based actor from headlining several upcoming independent films. Stelio recently became a spokesperson for Celiac’s, as seen in an interview with health entertainment site Foodista.com where he discusses going gluten-free for Celiac Disease. Stelio in photo still from upcoming film THE AWAKENED. In 2012 alone, Stelio filmed “Where The Road Runs Out”, as well as a television series and four other films, including “The Secret Village” (in a lead role), an indie thriller that was announced for ITN’s Cannes distribution slate in 2013; “The Shift” which stars Danny Glover and just won an audience award at the Palm Beach Film Festival; “The Awakened”, and “Jimmy” which stars Ted Levin, Patrick Fabian and Sharon Lawrence. Stelio Savante and Oscar Nominee Sally Kirkland in photo still from upcoming film THE AWAKENED. The South African star has been an active charity supporter for the Red Cross and the New York Says Thank you Foundation. Producing and performing ‘110 Stories‘ in NY in 2011; opposite Samuel L Jacksom, Jeremy Piven, Melissa Leo, Tony Shalhoub, Katie Holmes, Cynthia Nixon, John Hawkes, Kathleen Turner and several other performers. For his role and contribution to these charities, he was chosen and featured opposite performers such as Bruce Springsteen, Ray Romano, Patricia Heaton and John Stewart in the A&E documentary “When Pop Culture Saved America”. Savante was last seen on South African screens as Major Dixon in SAFTA winning, A Million Colours; as well as in “Breakout Kings” on DSTV. 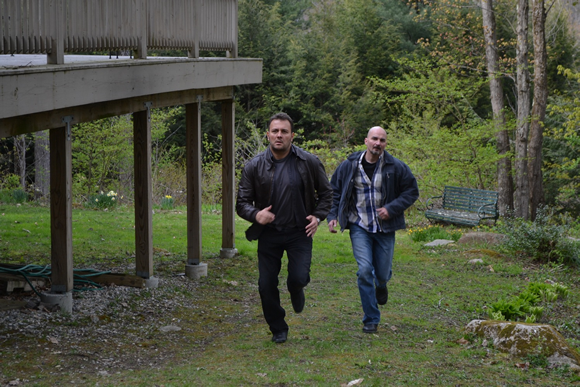 Stelio Savante and Kef Lee star in the upcoming film “The Secret Village”. Stelio was also recently chosen for a celebrity auction for Steven Spielberg’s ‘Children At Heart’ Foundation by lifetime achievement award winner, Joycelyn Engle. 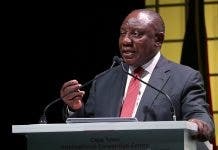 And he has since been named a South African notable on the South African Consulate’s website in New York, in a list that includes Nelson Mandela and Charlize Theron.